Mariah Carey and Nick Cannon – who clearly have no issue with commitment as they got married about five minutes after their first date. Still, the speedy twosome have since divorced and presumably avoid looking at their tats in the mirror. Fortunately, both her ‘Mrs Cannon’ tattoo and his ‘Mariah’ tattoo are on their backs. Foresight? Angelina Jolie and Billy Bob Thornton – who also apparently wore vials of each other’s blood around their necks. 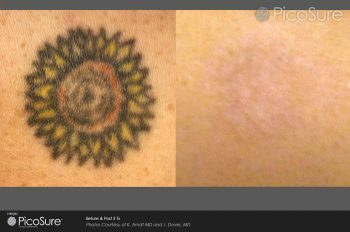 Post-divorce, Angie has had her ‘Billy Bob’ tattoo (which was hideous anyway) removed and covered up with a tattoo detailing the coordinates of her children’s birthplaces. Evan Rachel Wood and Jamie Bell – Serial offender Evan Rachel Wood, undeterred by getting matching black heart tattoos with ex Marilyn Manson, had hubby Jamie Bell’s initial inked on her ankle at some point during their on-off-on-off relationship. Unfortunately they’re now permanently off, but that tattoo is permanently on. Britney Spears and Kevin Federline – another duo who got married extremely quickly, B-Spears and K-Fed got matching sets of dice inked on their wrists; hers pink, his blue. Britney’s have mysteriously disappeared since their acrimonious divorce. Beyonce and Jay-Z – yes, we know these two are still together; but that doesn’t mean they don’t regret getting those matching ‘IV’ tattoos to mark their wedding. The most powerful couple on the entire planet have been subject to a LOT of scrutiny about the state of their relationship since Bey seemingly had hers lasered off last year. Is it really gone? Does it mean the end of the line approaches? Probably not, but we imagine they’re still bored of all the chatter.